Hawkesbury trainer Bernie Kelly understandably took extra satisfaction from his lightly-raced gelding Bobbing’s Wyong victory on Sunday. A five-year-old having only his fifth start, Bobbing ($3.20) overpowered $2.40 favourite Our Royal Egyptian in the Class 1 Handicap (1350m) after he had “given up” on him halfway through the race. Bobbing is a homebred by the deceased former Arrowfield stallion Beneteau (by Redoute’s Choice) from the Dehere mare My Dear, a mare Kelly trained and who provided him with his last city winner at Canterbury on New Year’s Eve 2003. “My wife Anne and I foaled Bobbing, so it’s a terrific thrill to be winning a couple of races with him,” he said after returning home from the Wyong meeting. “Bobbing was a late foal (November 24, 2013) and has been a slow maturer. “He has been a work in progress. Because of his length, he is a bit uncomfortable in the barriers and for that reason we use a barrier blanket on him. "Bobbing is still a bit raw and we’ll just take baby steps with him, but I’m sure he is going to handle longer distances later on. Kelly freshened Bobbing after that win and prepared him for a first-up assignment in the new racing season with a 1000m barrier trial hitout at home on September 10. He took advantage of talented apprentice Robbie Dolan’s 3kg claim to lessen his gelding’s weight to 56.5kg. However, Bobbing’s inside draw was of no use to him. He settled a clear last and Dolan started to ride him along at the 1000m. “I had given up on him; I thought he had lost interest,” Kelly admitted. Bobbing was the widest runner on the home turn, and unfurled a powerful finish to overwhelm his rivals and score decisively. 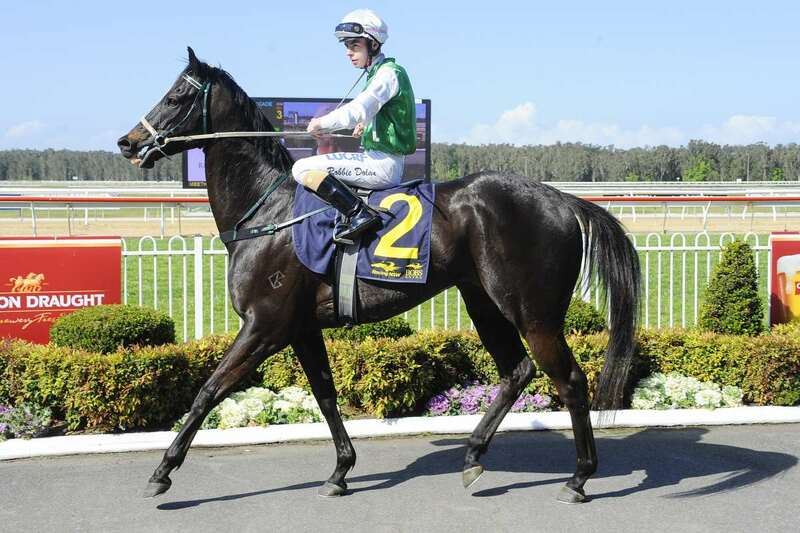 Kelly has only three horses – Bobbing, another five-year-old Atum (who has also won twice) and an unraced three-year-old – in work, and will await the Racing NSW handicapping panel’s assessment of the gelding’s Wyong success in terms of his Benchmark rating (62 prior to the race) before deciding future plans. Bobbing is the seventh foal of now retired 19-year-old mare My Dear, and is among the last crop of the ill-fated young stallion Beneteau, who ran third to another now successful stallion Star Witness in the 2010 Group 1 Blue Diamond Stakes at Caulfield. He was retired after only six starts and died in January 2013, having produced only two crops of foals at Arrowfield: “We had a minor share in Beneteau, and his death was a real loss to the breeding industry,” Kelly said.